I don't know about you guys, but the new Qbert designed QFO deck has me more than a little excited. While I stood at PLASA in front of it wondering just how it will work and plugged my contacts for more information, the only way we're going to find out just how this thing works is to see Qbert demonstrating this himself. 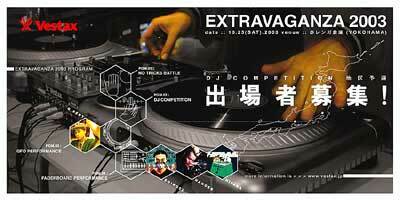 On 25th October 2003 at the Vestax Extravaganza, he'll be doing just that for the world to see. I'm sure there will be many photos from the event itself, but skratchworx is working hard to secure official footage from the event. Keep coming back for updates.